NSW double-decker electric intersuburban VSet.  <30-May-02>: A great, clever idea from Barry Andrews and implemented by André Schachtschabel - transparent background for the Track (F4), Next Station (F10) & Switches (F8) Monitors (shown above) - a must-get download, just extract the EXE and run it: monbackg.zip (29-May-02, 157kb) from the Train-Sim.com file library. To read more about Barry's idea and congratulate both he and André, visit the discussion thread at Train-sim. Also seen in the Train-Sim.com file library: Italian FS ALe601 "Rapide" trainset, ale601.zip (39-May-02, 4.7Mb); Acela Express power cars #2009 & #2020, modelled from scratch with a better silver texture to replace the default Acela power cars, aclahsel.zip (29-May-02, 2.6Mb).  <28-May-02>: webWiz thought it was time to download and install NALW's UP GE pack, up_gepak.zip (30-Apr-02, 17Mb). This pack contains 4 locos in Union Pacific livery: Dash 8 C40-8 #9188, Dash 8 C40-8W #9436 (pictured crossing Coram Bridge), Dash 9 C44-9W #9733 and AC4400CW #7149. As is usual with NALW's work, unique cabviews and sounds are included in the package. Naturally, you can use NALW's cabs and sounds to alias other Dash 8 or 9 locos you have in your roundhouse. A particular feature that webWiz enjoys is the in-cab signal aspect indicator so you only need the Track Monitor to check speed restriction changes and distances to signals. So the Track Monitor can be turned off for most of the time during a trip. 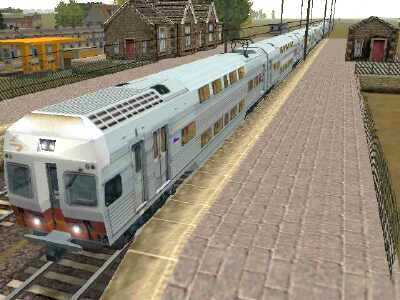 Some notable downloads from the Train-Sim.com file library over the past couple of days include: silver skins for the Acela to improve its looks (slvacel2.zip, slvace21.zip), Seaboard Air Line car carrier with cars loaded (sal_rack.zip), and many new European passenger cars and locos.  <24-May-02>: Step-by-step help to bring the Acela Express power car to its correct horsepower rating is now online - just click here to go to the Small Fixes 2 page. Over the next few days, webWiz will be investigating some different cabviews for the GP38-2, using an idea developed by Barry Andrews' post to the Train-Sim.com message area a short while ago.  <23-May-02>: An area not covered by the MSTS Tech Docs (found on CD 1) is sound development. In fact, the only source of information for any developer is the Train-Sim.com Sounds Developer message area. A page has been added here, Sounds development, on an idea used in a revised set of sounds for the Acela and HHP-8 locos (elecsnds.zip). These sounds are also included in NALW's revised Genesis sounds pack in gen_snd2.  <22-May-02>: The Train-Sim.com file library has a couple of tutorials for steam loco lovers: one on vacuum brakes and another on firing a steam loco, written by a retired steam loco engineer. A reminder that the Kuju developers overpowered the Acela loco - they gave it twice as much horsepower than it should be. So use WordPad to edit the MaxPower value in the Acela ENG file - change it from 9200kw to 4600kw. Apply the same edit to other trainsets using the Acela ENG file, such as the TGV Thalys. If you're not sure about editing an ENG file, see the ENG, CVF & SMS files page.  <19-May-02>: webWiz took the plunge and downloaded gen_pak4.zip from the Train-Sim.com file library - a 19Mb download over a dialup connection is the type of download to do reasonably late at night when there's a good movie to watch on TV! Gen_pak4 contains VIA Rail Canada P42 #902 in its new livery of dark green roof, silver sides and gold striping, with a set of Renaissance passenger cars. As well, this pack updates the cabviews of all NALW's P40s and P42s from previous gen_paks. You may want to change the horsepower of Chris Jenning's Intercity double-decker electric set to a more prototypical value - webWiz took a trailing zero off the 9200kw to make it 920kw in the ENGine file (at this stage, webWiz hasn't found the correct horsepower rating).  <18-May-02>: Notable downloads: NSW V-set double-decker intercity electric set by Chris Jennings from Australina Addons for MSTS. From the Train-Sim.com file library: the French X72500 diesel locomotive in TGV style; Amtrak P42 Sep 11 #911; Santa Fe #4033 & BNSF #8731 GP60s. Power users, you might like to look at a current thread on the message board about the "timestep" value used by MSTS in calculating speed. An associated discussion is on friction led by Joseph Realmuto who has researched the topic extensively to bring more prototypical performance and behaviour to how our trains run.  <16-May-02>: webWiz has had a chance to run the BR 506 EMU set. The "P" key (usually assigned to raising/lowering the pantograph on electric locos) is assigned to opening and closing the sliding doors on the passenger cars. When you do a run in winter weather, or at night, you'll see the flashes from the pantographs contacting with the overhead wires. The two files for the BR 506 are listed below for 14-May-02 line news. The Train-Sim.com file library continues to hold many new scenery objects and new additions over the past few days include several European rolling stock items.  <14-May-02> A page has been added to give you some ideas for the activity All the Way West (there are versions of this activity for both the default Marias Pass and Marias Pass 3 routes). webWiz is currently running this activity on MP3 with a 12,000 ton coal load headed by 3 SD90MACs and an SD80MAC. Downloads from the Train-Sim.com file library over the past few days that have caught webWiz's eye include: BR 506 EMU set, with sliding doors and night-time sparking pantographs (br506v11.zip, 2.3Mb, 11-May-02; the 2BIL cabview is required 2bilcabs.zip, 1.6Mb, 03-Apr-02); the Test Route, so you can see how points (switches), signal logic and AI trains operate together (sigtst1.zip, 115kb, 10-May-02); the Woodhead Route (U.K.) (wh10.zip, 10Mb, 09-May-02, and wh11.zip, 2.8Mb, 09-May-02; V2 will be soon released to complete the route). The 1955 Canadian Classic is now installed (after 2 or 3 attempts to get the seventh and final file downloaded across a mis-behaving dialup line). The 5 different passenger views from the Banff car are very well done, not to mention the work done to ensure the locos work prototypically. This train set has to be in your MSTS roundhouse!  <09-May-02>: webWiz has finally resorted to increasing the Break values to unrealistic values so he can take a train from west to east across Marias Pass. This technique eliminates the broken coupler problem at Cutbank. Since he was in control of the Amtrak Empire Builder with a large consist, he also had to alter the behaviour of the air brakes (all the air was being dumped, even when about 20% of braking was applied). To see what you need to change, look at the Small Fixes page under P42 brake recharging. In the Train-Sim.com file library, there are the usual range of excellent downloads, including a cabview for 4-window widecab SD40W's, such as the Canadian National SD40-2W in Expo livery by James Dilworth of Maple Leaf Tracks. Meanwhile, webWiz is struggling all the way west across Marias Pass with 10,000 tonnes of coal in 80 wagons headed by three SD75MACs and two SD70MACs. He was last seen waiting at Blackfoot for an eastbound freight to clear the line ahead. '70s style Amtrak passsenger car set (ampass.zip, 4.2Mb & ampasace.zip, 10.9Mb). webWiz has now downloaded 2 of the 7 files of the Canadian Pacific 1955 classic train set - 5 to go! Finally the page to change various engine parameters for the NSW class 81 and 82 locos to bring them up to more prototypical performance is posted - click here or use the menu table on the right.  <01-May-02>: A new set of sounds for NALW's Genesis locos pack is now available from the Train-Sim.com file library. The NALW site for news on current releases & upcoming products can be found at nalw.macfall.com.  At the time of this update, the Train-Sim.com file library is very busy so webWiz is patiently waiting to be able to log on and start downloading!  Email me at webmaster@wehdotwiz.zzn.com if you have questions or comments. I'll try to answer as best I can. Certainly post me if any step-by-step instructions on various how-to pages need clarification.